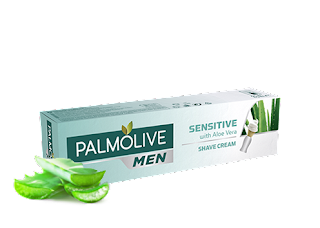 I'm back again testing another Palmolive for Men product. This time we look at Sensitive with Aloe Vera. As the name implies the shaving cream was designed with men who have sensitive skin while shaving. For me, Palmolive has never let me down. Always at the ready with consistent performance and that goes for this one as well but what makes this product good for sensitive skin? As far as I can tell this product has not been released here in the US if anyone knows differently please let me know. My tube was sent to me as part of some UK products that I didn't have time to review last year. The 100ml tube has a screw on top with I have lost already for that reason I kind of like the flip top caps that we see most often on toothpaste. The scent of this cream comes close to what I think is Irish spring which is also made by the same company. The cream itself is thick out of the tube and was easy to place on my brush but you can also place it into your favorite bowl for lathering just as easy. I started out with a little water on the brush but it was evident this cream likes the water and it responded with an amazing amount of lather once the correct amount was added. The rich thick lather really got into my beard and provided great coverage. It allowed my razor to go over trouble spots without irritations but this felt like the same shave I had when I used the original Palmolive. I really didn't notice the difference with Aloe Vera in the formula. Now I did have a great shave and the slickness and glide all good with great posts shave feel. Let's keep in mind that the Aloe Vera is 10th in its list of ingredients. This really didn't have that much effect on my skin like the Mavericks product did. Now if you want to see something that had a lot of thought put into it then check that one out. My question to Colgate would be what makes this a product for sensitive skin? Is it just the presence of Aloe Vera if that's it then I'll just use the regular one for now?